The spec is characteristically S-PVA, and indeed the 2407WFP utilises a slightly updated panel from Samsung as compared with the standard 2407WFP model. The only change on paper, other than the extended colour gamut, is the 400 cd/m2 brightness instead of the 500 cd/m2 on its predecessor. The design of the 2407WFP-HC is sleek and attractive. The front of the screen shows a nice thin black bezel, with a slight silver trim at the bottom. The stand is of a matt silver colour, and the panel itself features a matt-finish AR coating. From behind, the screen is mostly silver in colour and the stand is thin and well balanced. The materials are all of high quality, and the screen feels sturdy and well built. There is a very slight tilt of the screen to the right (due to the rotate function) which some users have also commented on. This is barely noticeable however, and some users have had luck correcting this by dismantling the stand and tightening a few of the joints. The screen offers a wealth of ergonomic adjustments, with smooth and easy height, swivel, rotate and tilt adjustments available. I always find that in this size sector, the real usability of a rotate function is limited, but the ability to rotate into portrait mode (as shown above) might be useful to some uses. The ergonomic adjustments were impressive on this screen, something which Dell are very good at with their premium models. The tilt and height adjustments are particularly useful on a screen of this size, and afforded me the option to set the screen to a comfortable position. You can even lower the screen to be pretty much on the desk! The OSD operational buttons are inset into the bottom corner of the bezel and are easy to operate. As shown above, there are quick selection buttons available for input, PiP / PbP, and the ' + ' and ' - ' buttons also give access to brightness/contrast and auto image adjust (for analogue signals). The power button glows a soft green colour during operation, and switches to amber when in standby. The OSD is well laid out, and easy enough to navigate. There really are a lot of options and sections, but the interface felt intuitive. The back of the screen offers a wide range of interface options as shown above. The availability of S-Video, composite and component is a nice feature, and useful for external devices such as DVD players and games consoles. 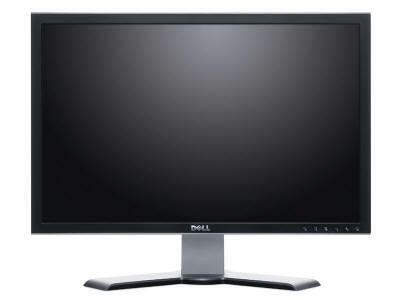 You can also get an optional Dell Soundbar if you want to make the 2407WFP-HC an all-in-one multimedia screen. The back of the screen also offers 2x USB 2.0 ports, as well as an upstream port to connect the screen to your PC. Once connected to the PC, the ports on the monitor function, along with the integrated 9-in-2 card reader. 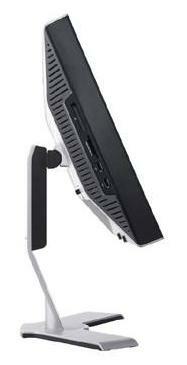 The 2407WFP-HC offers a handy 9-in-2 card reader along with 2 additional USB 2.0 ports on the side of the monitor. The card reader can support CompactFlash type I/II Card, MicroDrive, Smart Media Card, Memory Stick Card, Memory Stick Pro Card, Memory Stick Duo (with Adapter), Secure Digital Card, MultiMedia Card and Mini Secure Digital (with Adapter). The back of the stand also features a useful slit which can help keep cables tidy and out of the way. The stand is detachable and the screen is VESA compliant. The Dell 2407WFP-HC utilises an 8-bit Samsung S-PVA panel, capable of producing a true 8-bit, 16.7 million colour palette. The enhanced W-CCFL backlighting used offers a gamut covering 92% of the NTSC colour space, an improvement over standard backlighting which only really matches the sRGB colour space, at 72% of the NTSC gamut. An important thing to consider for most users is how a screen will perform out of the box and with some basic manual adjustments. 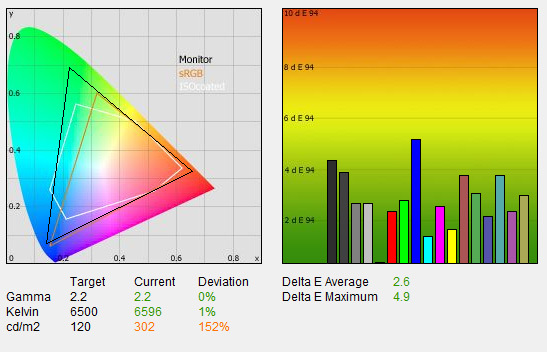 Since most users won't have access to hardware colorimeter tools, it is important to understand how the screen is going to perform in terms of colour accuracy for the average user. I restored my graphics card to default settings and set it to its standard profile. The 2407WFP-HC was tested at default factory settings out of the box using the LaCie Blue Eye Pro and their accompanying software suite. Default settings of the screen were 50 brightness, 50 contrast. 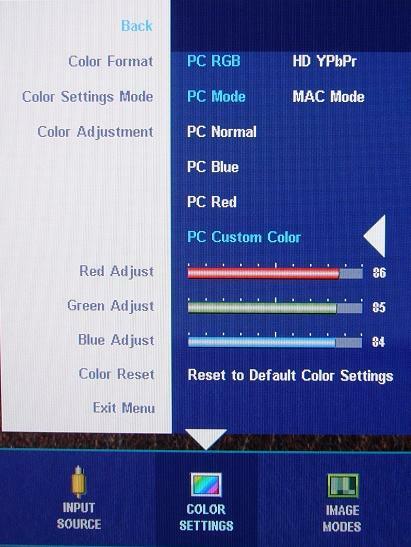 The 'Colour Setting Mode' was left on 'PC Mode' and the colour adjustment section showed that RGB levels were all at 100. Testing the screen at default settings showed some quite pleasing results. You could tell before even connecting the colorimeter that colours felt even and contrast and brightness felt pretty comfortable. The main area where the default settings were out was the luminance, with brightness set at 50 in the OSD, the screen reached 302 cd/m2, a considerable way off the desired 120 cd/m2 for LCD displays in normal lighting conditions. Fortunately, this is easy enough to rectify with manual adjustments, and reducing the OSD setting to around 25 - 30 should result in a more comfortable user experience, particularly in low lighting conditions. Gamma was spot on at 2.2 and colour temperature was also very good, at 6596k (only 1% out from the desired 6500k). From the triangle on the left hand side CIE diagram of the report above, you can tell that the gamut covers more than the sRGB colour space, with a particular improvement in the green shades. This is a wider gamut than regular backlighting can offer, and confirms the screen is using enhanced CCFL's. With luminance recorded at 302 cd/m2, black depth was an average 0.45 cd/m2. This gave a useable contrast ratio of 671:1, not quite reaching the specified 1000:1 the screen is reported to be capable of however. With an average DeltaE of only 2.6, the 2407WFP-HC is pretty good in terms of colour accuracy, even without calibration. This is pleasing to see, since it means users can buy the screen and achieve some decent reproduction of colours, even if they do not have access to hardware calibration devices. DeltaE only reached a maximum value of 4.9 when rendering blue, again a pleasing result, and certainly vastly superior to some other screens we have tested at default settings. For instance, the other wide gamut screen we have tested recently, the Samsung SM931C, showed some very poor colour accuracy out of the box, with an average DeltaE of 9.4. This can be corrected to a point, but most users aren't going to have access to a colorimeter to achieve this. With this screen, you don't even need to in order to get some decent performance. During the calibration process brightness was altered to 28, contrast was left at 50 and RGB values were changed to 99, 94 and 97 respectively. The results from the tests were again pleasing, with some marked improvement in areas previously needing correction. Gamma remained at the desired 2.2, but colour temperature was corrected slightly to 6532k. The obvious improvement was that luminance was now corrected to 120 cd/m2, resulting in an improved black depth of 0.22 cd/m2 and producing a useable contrast ratio of 545:1. In practice, the screen felt more comfortable and less harsh on the eyes at these settings. I was hoping for a slightly better black depth from the screen to be honest, since it is based on an S-PVA panel renowned for decent performance in this area. A level of 0.22 cd/m2 is not bad, but does fall a little behind some other screens we have tested, including the PVA based Samsung 971P (0.1 cd/m2), and even the TN Film based Samsung SM932B Plus (0.14 cd/m2). There wasn't really any change from my personal use Dell 2405FPW in fact, which was tested with a black depth of 0.2 cd/m2. PVA technology is certainly capable of producing a decent black level, but it seems perhaps Samsung haven't quite achieved this with their larger panels yet. At least the calibrated result was a nice improvement over the default 0.45 cd/m2 level, which is at best, average. DeltaE values were also improved nicely, with an average value of 0.8 being recorded. LaCie would consider the colour fidelity excellent, and even a maximum value of 2.4 leaves the screen offering only a barely detectable difference between the colour requested, and that displayed. Colours still felt even and looked a little better adjusted even to the naked eye. Without a colorimeter though, most average users would probably be hard pressed to notice much real difference in colours between default and calibrated settings. The 2407WFP-HC is certainly capable of offering some pretty good colour accuracy making it suitable for graphic and photo work if necessary. There are more professional models available for even better accuracy, but these will certainly not compete with the Dell from a price perspective. 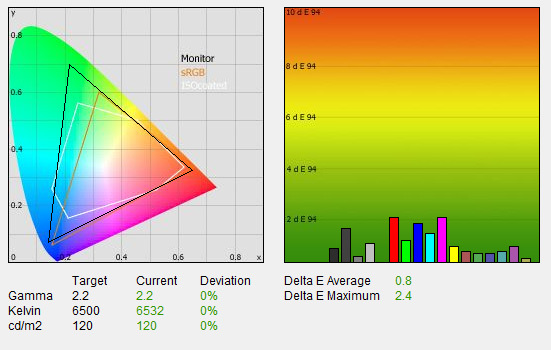 The wide 'HighColor' gamut is certainly an attractive feature for those who work with extended gamut content and are looking for the latest technology from the more affordable monitor range. In practice green shades were improved and felt deeper, something also noticeable from the CIE diagram above, where the most obvious improvement in the colour space came towards the green hues. Testing the screen with colour gradients showed nice smooth transitions between colour shades, and no detectable banding. Viewing angles of the 2407WFP-HC were very good, as you'd expect from an S-PVA panel. From the sides, the image remained good, even at extreme angles, and this was the same when moving vertically. The screen didn't display the characteristic darkening of the image from below as you would see from TN Film based models, and although there was evident contrast shift, it never really proved a problem from any position. There was evidence of a slight contrast shift as you moved away from a central view of the screen, something inherent to VA based matrices, and something commonly cited in the VA vs. IPS argument. In reality, it's very hard to detect this anomaly, and I doubt it would really bother most users. In our usual testing process I viewed an all black screen in a darkened room, which allowed me to test the uniformity of the panel and to examine whether any backlight bleed was evident. There was no detectable leakage from the backlighting, and the uniformity remained very consistent. A good performance from the 2407WFP-HC again. 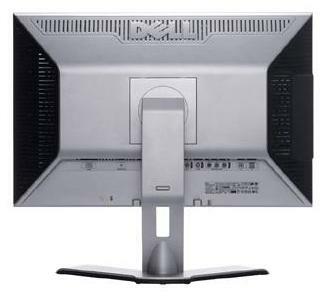 The screen offers both VGA and DVI interfaces. The image quality was excellent on both, but text appeared slightly sharper on the DVI interface as you might expect. You will need to adjust the screen from its standard 50% brightness to around 25 - 30 if you intend to use the screen regularly for light background office use, or in low lighting conditions. This will correct the excessive default brightness to around 120 cd/m2 which is recommended. The Dell 2407WFP-HC was tested using the chase test in PixPerAn, a good bit of software for trying to quantify differences in real terms responsiveness between monitors. As a reminder, a series of pictures are taken on the highest shutter speed and compared. The images above show the best case example on the left hand side, and the worst case example on the right hand side. This should only be used as a rough guide to comparative responsiveness but is handy as a way of keeping a constant test of each screen. As you can see from the above images, the 2407WFP-HC performed very well in these tests. It was a little ahead of another new 24" model, the ViewSonic VX2435WM, but not by much. It did remain a little behind the popular NEC LCD20WGX2 however, a screen widely regarded as being one of the fastest available, and popular amongst gamers. To the eye, you could tell there was some slight blurring of the moving car, but no obvious ghosting images were detectable. In gaming, there was some motion blur evident if you know what to look for, but nothing which is really going to bother most average users I would suggest. This good performance is made possible through the aggressive use of RTC technologies, boosting grey to grey transitions to a reported 6ms. Compare this with the original 2405FPW model which featured only slight RTC and a 12ms G2G quoted figure, and Samsung have clearly made some improvements with their PVA / S-PVA panel technology. In fact, it is Samsung's 6ms G2G generation which showed the most improvement in practice compared with the non-overdriven generation of PVA panels. The Dell 2407WFP-HC is in keeping with this trend. However....the aggressive application of RTC is not without it's issues. We have published a separate article regarding the 2407WFP-HC's unfortunate ghosting issues. Without going into too much detail here, this issue manifests itself by a noticeable black ghosting when moving a light coloured object over a dark background. This was something I was keen to test since there had been many reports of this issue across internet forums. At the time of this review, Dell are working towards a fix for this issue, perhaps something which will be updated in an A01 revision of the screen? We will have to wait and see on that one. In practice the artefact was easy enough to produce, but interestingly seemed to get more apparent the longer the screen was left on. Presumably the screen needs a chance to really warm up before the issue becomes very obvious. By moving a white cursor across a dark grey background, you could see a black ghost trail behind the moving object. This is most likely due to the control of the RTC impulse and is something which can be an issue on other screens where a strong overdrive impulse is used, and control is poor. In this case it appears that as the liquid crystals are being asked to change from a light state to a dark state, by changing their orientation, the RTC impulse is causing them to 'overshoot' the required state, and twist to produce a full black shade. This then corrects itself to the desired orientation and requested dark colour, but not without the black state being obvious as a ghost image. I won't go into more detail here since our other article covers the issue in full. Updates will appear in that article when they are available. However, for the purpose of this review I will confirm that I did notice this strange artefact and it was easy enough to reproduce. I can confirm that even with correct calibration with a high-end colorimeter, the issue was still there. However, in gaming I didn't really find it a problem, but it will really depend what game you are playing. It's not something which every user notices, but if you are concerned, I would consider either purchasing a regular 2407WFP model, or waiting for a hopeful fix. Ghosting issue aside, the 2407WFP-HC performed well in terms of panel responsiveness. One other thing to bear in mind is that you will need a pretty powerful graphics card to run this screen at its full 1920 x 1200 resolution in modern games. If you can't do this, the screen does offer hardware level aspect ratio control, with options for 1:1 pixel mapping, fill, and aspect available. 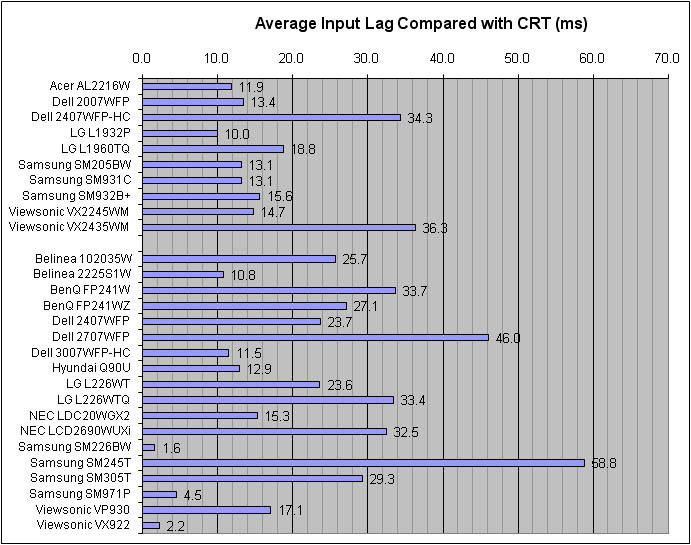 The above graph shows the average input lag across several screens tested at TFT Central (top section), and also average input lag as recorded from other sources (bottom section) on some popular and well established models. The Dell 2407WFP-HC showed some average performance in this test, with an average input lag of 34.3ms. This is a little behind other screens we have tested, but remains comparable to the ViewSonic VX2435WM, another 24" screen we tested recently with an average input lag of 36.3ms. The 2407WFP-HC did reach up to 50ms in some cases, leaving it a little behind some other screens (including the Viewsonic VX2435WM = 41ms max). If you compare the HC edition with the standard 2407WFP, you can see the older version commonly had an input lag of ~23.7ms. As usual, this is maybe an issue for some serious gamers, but probably not to most normal users. HDCP support over a digital interface is vital for viewing HDCP encrypted content. Thankfully the DVI interface offers this support. It might have been nice to see an additional HDMI port included as well, something which is becoming more common on larger screens nowadays. Viewing angles must be wide if you intend to have more than one person watching the video. Thankfully the S-PVA technology is strong in this regard. Black depth must be good to allow darker scenes to be rendered correctly, and for detail to be distinguishable. The 0.22 cd/m2 black depth is adequate for this and the contrast ratio is decent enough (545:1 after calibration). Movie noise must be kept to a minimum, otherwise artefacts and twinkling in large colour masses can be noticeable. The high resolution of the 2407WFP-HC means that any compressed or low res content looks a little blocky, and any compression artefacts are accentuated. Noise is noticeable as well, something which is common on modern aggressively overdriven PVA / S-PVA panels. However, if you sit a couple of metres away, which you'll want to with a screen this size, there is no real issue in practice. 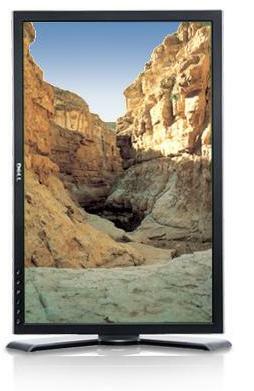 All in all, the 2407WFP-HC is a very impressive screen. At the time of writing, the retail price in the UK is a very attractive £447. 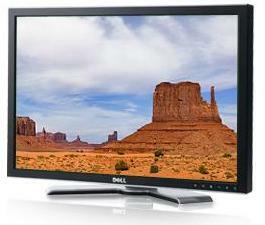 Cheaper 24" models are beginning to emerge, but the Dell remains one of the more premium models and does not limit itself to TN Film technology as some other models have begun to. The display really offers about everything you could want, with a huge range of ergonomic and connectivity options. The design is nice and the build quality is excellent. Performance is very good in all areas, and ghosting issue aside (which will hopefully be fixed at some point soon), the 2407WFP-HC can offer some impressive performance in games as well. The addition of enhanced W-CCFL backlighting is a nice touch, and offers a little something extra compared with many other current 24" screens. I was impressed with this screen, and would certainly rate it highly in the ever expanding 24" sector.